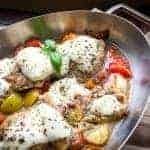 My favorite thing about this one pan Keto Pizza Chicken Thighs recipe is just that : One Pan! Don’t you just love dinners that can be cooked using only one pot or skillet? I sure do! I’m totally in love with chicken thighs. Don’t get me wrong, the breasts are great as well, but they can be a little dry in some recipes. Because chicken thighs have a slightly higher fat content, they tend to be juicier in a recipe like this. And we are ok with a little more fat because we are KETO! You can use any type of small or cherry tomatoes for this recipe. I do like the multi-colored heirloom cherry tomatoes that my supermarket conveniently sells in a blister pack, they make this recipe look super pretty. For me presentation is important, I like my food to look as good as it tastes! As far as the cooking goes, my favorite oven proof skillet to use is this high sided cast iron pan. It is perfect for this recipe as well as any recipe that calls for sauteing or frying then finishing the meal in the oven. 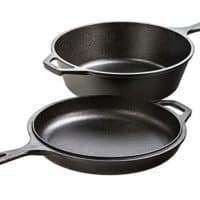 It’s a cast iron Dutch Oven with an extra skillet that can be used as a lid, it’s perfect! Check out my Apple Cider Braised Chicken recipe, it’s another One Pan Wonder! The one pan keto pizza chicken thighs are less than 2 net carbs per serving. They would be absolutely perfect paired with keto mashed potatoes, which of course is really cauliflower puree. But honestly, my kids are so used to eating that instead of potatoes I think they would think anything else tastes weird! Here are my instructions for Keto Mashed Potatoes. 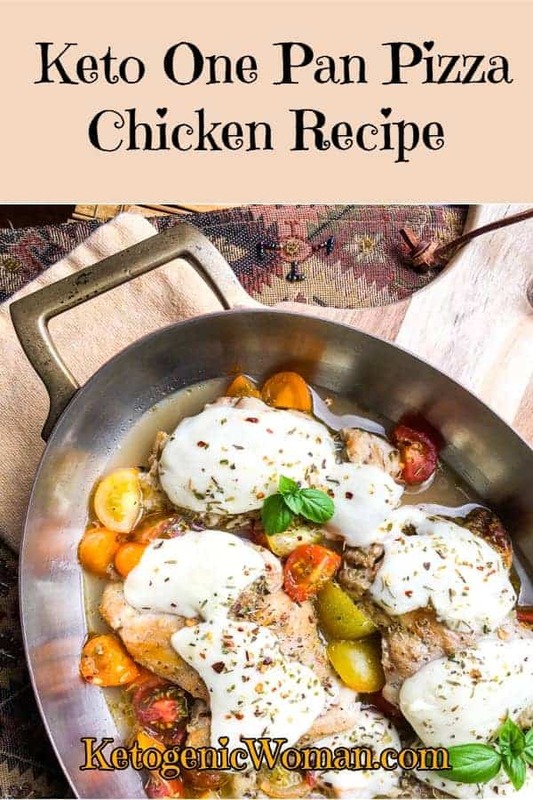 The printable recipe card is just below for One Pan Keto Pizza Chicken Thighs. Let’s get cooking! Heat 1 tablespoon olive oil in a large, oven-safe skillet over medium heat. Rub the chicken thighs with the remaining olive oil and sprinkle both sides with one tablespoon Italian seasoning. Season with salt and black pepper, to taste, and transfer to the hot skillet. Cook for 4-5 minutes per side, or until the chicken develops a golden crust. Remove from heat and add butter, chicken broth, and cherry tomatoes. Top each chicken thigh with a slice of fresh Mozzarella cheese and sprinkle with crushed red pepper flakes and remaining Italian seasoning. Season with additional salt and black pepper, if desired. 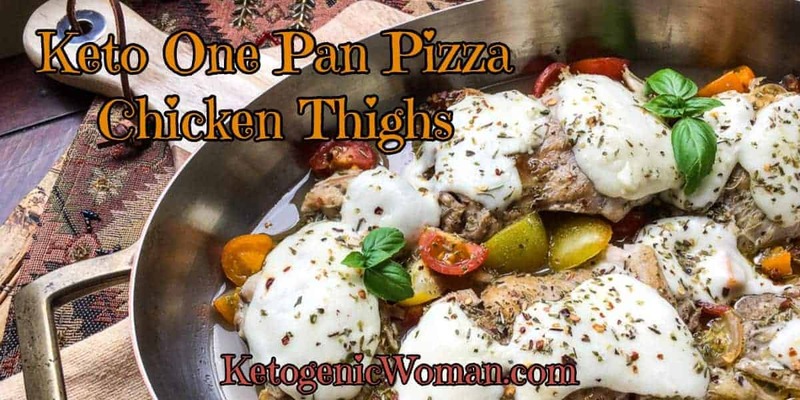 Save this One Pan Keto Pizza Thighs Recipe to Pinterest below! Tagged clean keto recipe, keto chicken recipe, keto dinner recipe. Bookmark the permalink.